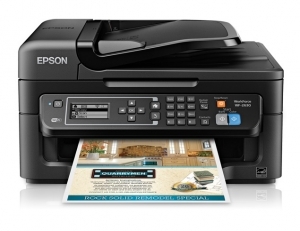 Epson WorkForce WF-2630 4.7ipm Inkjet Multifunction Printer + Warranty Extension Offer! + $50 Cashback! Purchase this printer and redeem a $50 cashback! Visit https://www.epson.co.nz/competitions/data/2019_900105/promotion.asp for terms, conditions, and redemption. Valid until the 30th of June 2019. Easily print from tablets and smartphones with the WorkForce WF-2630, offering fast print speeds for the home office. Boasting the smallest footprint of any printer in its class, this wireless all-in-one touts affordable individual ink cartridges and essential print, copy, scan and fax features. Getting organized is a breeze with a useful 30-page Auto Document Feeder for scanning, copying or faxing stacks of documents — you can even scan to the cloud. Plus, this reliable performer produces laser-quality text and smudge, fade and water resistant prints. From boarding passes to brochures, the WF-2630 will be ready when you need it. • Ideal for the space-constrained home office, the WorkForce WF-2630 is a fast, high-performance all-in-one that offers affordable, individual ink cartridges within a space-saving, compact design – the smallest in its class. This powerful inkjet saves time with fast speeds up to 9ppm (ISO black) and 4.7ppm (ISO colour), plus a convenient, 30-page Automatic Document Feeder. 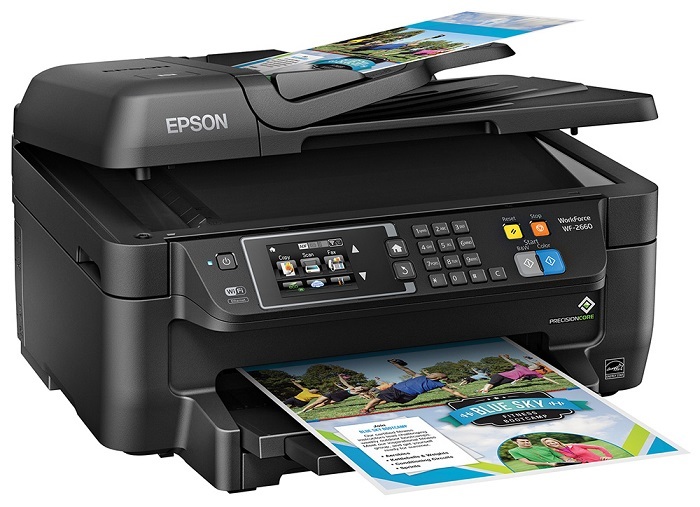 For easy setup and sharing on the Home and Office network, the WF-2630 comes with built-in wireless connectivity, and features Epson Connect so you can print and scan from anywhere. • Easily print documents, emails, photos and web pages while on the go. Your customer can print from the comfort of your couch, their office or even across the globe using Epson Email Print, the Epson iPrint Mobile App and Epson Remote Print. Epson iPrint even allows your customer to scan documents, save them to the cloud and access them from anywhere. All they need is an Epson Connect enabled printer and their smartphone, tablet or computer. Get ready to change the way to print and scan. • Quickly copy, scan and fax stacks of originals with the 30-page Automatic Document Feeder. With the included OCR software, you can turn forms and documents into text-searchable, editable PDFs. You can even scan-to-email or scan-to-PDF. • Connectivity: High–Speed USB — Compatible with the USB 2.0 Specification.